More thriller than traditional horror – a home invasion movie wrapped in a bloody package – You’re Next delivers. It does what so many horror movies seem to neglect – it gives us a chance to get to know the characters. It feels like a real dysfunctional family dinner. The looks, the fights, the old rivalries just beneath the surface as various members attempt to play nice. The casting is spot on: Ti West pokes fun at art directors everywhere who take themselves too seriously, complete with a gigantic hipster scarf. Barbara Crampton as the maternal figure reaching for perfection, who seems a few utensils short of a complete impeccably polished silver serving set. Crampton projects a powerful vulnerability while being the firm matriarch who is tired of refereeing her children’s squabbles. Sharni Vinson is just stellar. This movie has proved that she can do it all and the world will be seeing a lot more of her. We get everything in this dynamic, the jock, the intellectual, the goth girl – but they are all written much more interestingly than a flat stereotype. The kills are impressive and at times emotionally brutal. The animal masks serve as a great visual, a unique take on the face-less killer. And the rest… Well the rest gives too much away until you see the movie. 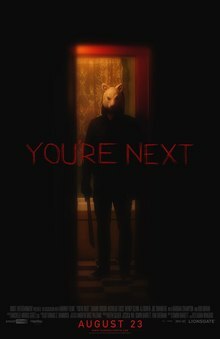 You’re Next should be the next movie you see. This entry was posted on August 25, 2013 by 850music in Posts and tagged Movie Review.